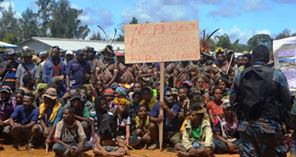 The years of waiting for royalty payments and failed attempts by landowners of the LNG Project in Hela to get the attention of the government on this matter has led to a situation where they won't allow gas production to continue until they get what was promised to them in the UBSA signed in Kokopo over five years ago. The landowners’ representatives of PDL 1, 7 and 9 in an open forum up in Komo on Wednesday aired their concerns; the main ones included the long overdue royalty payments, the development funds and the dragging Clan Vetting process that has been going on for such a long time now. In response, the Chief Secretary to the Government, Ambassador Isaac Lupari clarified that none of the project funds have been used as mortgage for securing loans by the government and that none of the money belonging to landowners have been used for any other purposes. “The royalty of K135million and the K135million Development Levy are both secured in the Central Bank pending the completion of the clan vetting process,” said the Chief Secretary. Meantime, the clan vetting process is seen as an obstacle by the landowners to the releasing of the funds and as such they have called for a fast tracking of the process to enable the release of the funds; however, the Mining Minister Dixon Duban said it is vital the process is properly done because it is through Clan Vetting that the rightful landowners are identified and paid accordingly. However, landowner representative of Hides PDL 1 Mr. Larry Andagali is not convinced and wants a time frame to be given to have payments ready as proof. Responding to Andagali’s request Minister Duban announced that there will be a time frame of 30 days to commence right after this month’s parliament sessions to allow for the final phase of the clan vetting process to take place. The Minister will also be talking to the head of the Alternate Dispute Resolution (ADR) process Justice Ambang Kandakasi to meet with the landowners after the period to allow for the process to be completed. Currently the matter of identifying landowners is now in the Court’s hands and the Minister has no power to sign off anything yet to have the funds release for the Hides landowners. Duban also appealed to the people to corporate and get the clan vetting process done soon so that the payments can be made. Meanwhile, the landowners threaten to continue to shut the Hides Gas Plant until they finally see the funds released. Police are also maintaining their presence on ground.